Will ZetaTalk and their Emissary Nancy ever receive an apology from NASA for their years of asserting that Nibiru does not exist, when there it was in the skies, inbound right when and where ZetaTalk said it would be? Will we ever receive an apology from the CIA and DIA for their years of seeking to discredit ZetaTalk, and their paid black ops campaigns to harass Nancy? Let’s look at history for the likely answer. The Catholic Church insisted the world was flat, due to their interpretation of a Bible verse. Thus armed with arrogance, they burned people at the stake and threatened Galileo, who was trying to get the truth out. The church formally apologized to Galileo in 1992, 350 years after his death. The Flat Earth Society is still alive and well today, however. In 1600, a man named Giordano Bruno was convicted of being a heretic for believing that the earth moved around the Sun, and that there were many planets throughout the universe where life existed. Bruno was burnt to death. The Church eventually lifted the ban on Galileo's Dialogue in 1822, when it was common knowledge that the Earth was not the center of the Universe. Samuel Birley Rowbotham, an English inventor, created the Flat Earth Society in the early part of the 1800s. 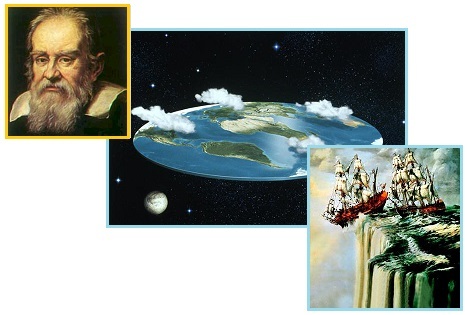 The Flat Earth Society mission statement was “to promote and initiate discussion of Flat Earth theory as well as archive Flat Earth literature.” Even though the Flat Earth Theory was abandoned during the fourth century BC when the Greeks hypothesized that the earth was a spherical shape, there were still many who held onto the belief that the earth was flat. The Church of England officially apologized to Darwin for harassing him about evolution, 126 years after his death. 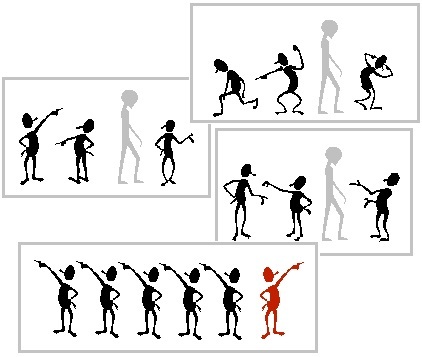 One need only tune into the ultra-right religious groups in America insisting that Creationism be taught in schools to realize that resisting obvious scientific proof on evolution is alive and well also. The Church of England will tomorrow officially apologise to Charles Darwin for misunderstanding his theory of evolution. In a bizarre step, the Church will address its contrition directly to the Victorian scientist himself, even though he died 126 years ago. Per the Zetas, they will not hold their breath for an apology from NASA or the CIA or DIA or any other in the establishment who insisted that lies be held as truth. It is, after all, somewhat human nature! ZetaTalk Observation 1/15/2002: In any discussion about human science there is more than discussion about facts, assumptions, and theories. There is also posturing and the need for comfort. Postulating a theory becomes, too often, a matter of ownership and pride. The theory thereafter cannot be wrong, or the owner is somehow discredited and falls in stature. Then there is the structure built around a theory - published books, lectures and curriculums, clubs meeting regularly and discussing the matter. All this is like a web, holding the theory up, and any attempt to change the theory brings howls of distress from the web which must likewise change. Thus, in human society, one has the Catholic Church apologizing only recently for dismembering and burning alive those who pronounced the Earth round, not flat, and the Flat Earth Society still in existence today. How are the sciences, in human society, treated any differently today? Einstein’s works, when first presented, were not only pronounced wrong, but were shouted down. They were treated by those whose posture required the existing theories to continue as a threat, which Einstein’s work was. The worst garbage could be calmly discussed, but Einstein’s lectures were disrupted by shouting sessions and physical assaults. This was, one was to assume, because Einstein was wrong, but in fact the heat of the debate was the opposite, because he was, compared to the existing theories of the day, correct. But Newton is still taught in the schools, to the young, along with Einstein’s theories, and when they contradict the students are expected not to notice. This is because the professors require a posture of being all-knowing and infallible, and any student implying otherwise suffers at their hand. It has frequently been noted by the Zetas that Africa is a target among countries positioning for the Aftertime. The reasons are many. Africa will be above the waves, even after the sea level rise expected within two year after the Pole Shift. It is high ground. It is relatively under-populated, in that it is relatively undeveloped. The populace has recently been colonized, thus theoretically by habit or tradition could again be dominated. And there are no standing armies of sufficient force to resist an invasion. Africa can also be expected to be invaded by drowning hoards from Europe and India, after the Pole Shift. ZetaTalk Insight 11/5/2011: How are the elite planning to carve up Africa, re-colonize it in essence, and will there be clashes? We have mentioned that France is clearly eyeing Libya which has oil reserves and a large aquifer. They will pour across the Mediterranean in anything that floats, overwhelming the ability of countries on either side to maintain order on the coasts. Then there is the migration from SE Asia as the Sunda Plate sinks, and the eventual migration from India. Africa today has a large Indian population in those countries bordering the Indian Ocean, and the coastlines are scarcely secured by these poor nations. Illegal immigration has a long history in the world, the techniques well known. Those standing in water, with no hope of a different future, will migrate to dryer land and a better future. Cargo ships will be diverted from their usual cargo to a more profitable cargo - desperate refugees. We have long mentioned that the country of S Africa will be a target of the elite, for several reasons. It is an ideal jumping off point for those wanting land rights on the new land to emerge near Antarctica and on Antarctica itself. It was long under colonial rule, Apartheid long in its history only recently broken in 1994. Traditions and expectations are not easily erased, so the country would be considered friendly to an invasion by white men with assets. S Africa's infrastructure, on a continent that has only spotty development into an industrial state, is self-sufficient. Thus self-sufficient, it has already taken the first step toward what the elite view as a necessary part of bunker security - technological self-sufficiency. S Africa will be invaded not by drowning immigrants but by the elite with entourage and security guards. All will be demanding service and barking orders at each other, with pecking order battles inevitable. Given all that, what are three Presidents from the US (Bush, Clinton, and Obama) doing in Africa at the same time, in the days prior to the annual 4th of July holiday in the US? Per the Zetas, it is clear they will be Obama’s envoys during the push to develop Africa so it can support migrants from flood stricken areas. 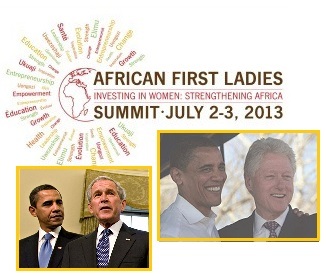 On July 2-3, 2013, the Bush Institute will host the African First Ladies Summit, “Investing in Women: Strengthening Africa,” in Dar es Salaam, Tanzania. The Summit will highlight the critical role First Ladies play as advocates for women and girls, and provide examples and models of programs that are working to better the lives of women and girls across the continent. First Lady Michelle Obama and Mrs. Laura Bush will hold a discussion moderated by Cokie Roberts. President Obama isn't the only prominent American traveling to Africa in the days ahead. Former president George W. Bush, who made the fight against AIDS in Africa a major part of his administration, will soon be heading to Zambia and Tanzania. Even though the exact reason for Mr Clinton’s visit was not made clear, analysts said he was expected to meet political and civil society leaders “in a bid to strengthen the democratic dividends” in Senegal. ZetaTalk Explanation 7/13/2013: We stated that Obama intended to offer assistance to African countries during his early July, 2013 trip there, so that they could better absorb migrants from Europe and India during the flooding expected both before and after the Pole Shift. It has been a tradition to use former US presidents after disasters to act as envoys for disaster relief. Here this type of partnership is being employed prior to the disasters. They will stand in Obama’s stead, acting as his envoys, to establish how US aid can be utilized to help Africa develop its resources so as to support migrants. Clean and readily available water is key. 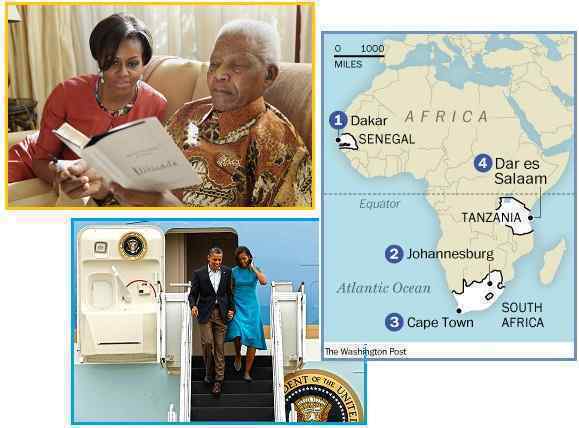 Obama’s trip to Africa involves a stop in three countries – Senegal (where he crosses paths with Clinton), S Africa, and Tanzania (where he crosses paths with the Bushes). Per the Zetas, the coming announcement admitting the presence of Nibiru and the anticipated rush to Africa is very much on the agenda. When the first family departs on June 26 for a weeklong visit to the continent that will bring them to Senegal, South Africa and Tanzania, they'll kick into motion an expansive security procedure that is typical for any presidential travel. The president is expected to spend time re-affirming partnerships with the sub-Saharan powers and emphasizing the importance of global health programs, including HIV/AIDS prevention. ZetaTalk Insight 6/22/2013: Beyond the need to have many countries lined up and included in the coalition of countries that will simultaneously make the announcement on the near presence of Planet X, aka Nibiru, is the issue of Africa as a magnet for so many peoples that will be flooded when the wobble worsens and plate movements accelerate. France will export its people to Libya but other European countries will press for land ownership and VISA rights in former colonial holdings. India will swell its immigrant population in and near Tanzania. Russia is seeking alliances with the Muslim dominated countries along the Red Sea, based on religious sympathies. And South Africa will be the plumb the wealthy will seek to dominate. We have repeatedly stated that Obama has warned countries in Indonesia and Central America that they cannot expect to immigrate to the US when their flooding worsens. Their neighbors must take them in, with Indonesia looking to the high lands of Asia and Central America looking to S America, which has high lands aplenty. Russia, China, Australia, and the US have taken a firm stance on unfettered immigration, with many other countries such as New Zealand and Switzerland following suit. Africa has the land mass, but many regions are undeveloped so lack access to clean water from wells. US aid directed to opening these lands could be arranged, before the flood of migrants arrive. Were the Zetas on target when they predicted US aid money would be promised to develop Africa? Pumping water requires electricity to be most efficient, after all, for the “promise of the continent” to be actualized. US President Barack Obama warned Sunday that Africa could only fulfil its rising potential with leaders who strive to improve the lives of their people, decrying “thugs and warlords” who hold back the promise of the continent. In a strident call for democratic change and good governance, Obama used the political legacy of ailing Nelson Mandela and South Africa’s emergence from grim years of apartheid as proof that freedom will ultimately prevail. The Zetas have described the great Pacific Plate as actually being four plates. ZetaTalk Explanation 11/20/2010: We addressed the fact that the Pacific plate is not one plate, as assumed. In fact, it is at least four plates. The rise and incident of islands from Kamchatka to Hawaii to the Society Islands shows this to be a plate boundary, down the center of the Pacific. Call that land to the east of this plate boundary the East Pacific Plate. 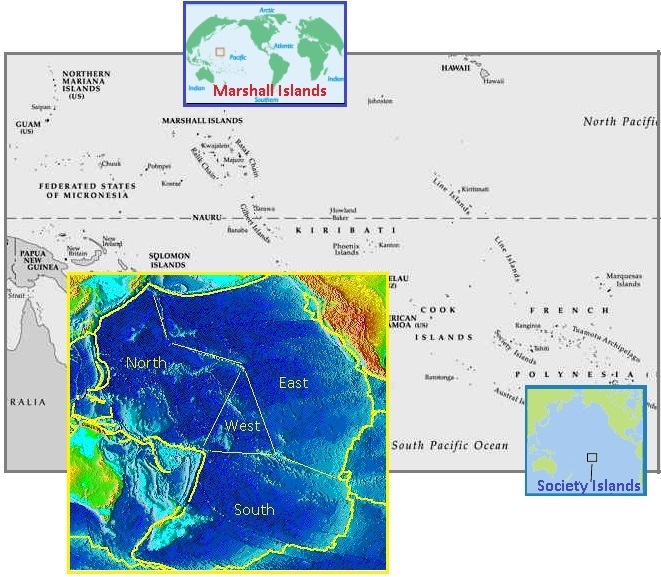 There is also a triangle of a plate between the points of Hawaii, West Samoa, and the Society Islands. Call this the West Pacific Plate. Below the Society Islands is a plate which could be called the South Pacific Plate. And the portion of the Pacific Plate pushing under Japan and pushing under the Philippine Plate could be called the North Pacific Plate. The East Pacific Plate is subducting under N America but rising along the island chain which includes Hawaii and the Society Islands. ZetaTalk Explanation 6/12/2010: Hawaii, which rides higher after every major adjustment in the area, is rising, and this can only be the case if there is subduction of a plate somewhere, pushing the plate that Hawaii rides on up. The Society Island are on a chain that forms a line with the Hawaii Islands, and such a rise is not a coincidence. This is also a fault line, where a plate that is subducting under the Americas is rising commensurately along these island chains. There is a fault line running from Kamchatka to the Society Islands, and both will rise during the pole shift. The West Pacific Plate is subducting under the rising eastern edge of the Indo-Australian Plate, and sliding under the western edge of the East Pacific Plate – an overall loser in the plate movement game. ZetaTalk Explanation 1/15/2011: The islands at the plate borders in this region do not do well during the plate adjustments to come. The primary devastation will come during the hour of the pole shift, but the devastation has started during the 7 of 10 adjustments. Samoa rides on the Pacific Plate, which is pushing under the eastern edge of the Indo-Australian Plate, and as this process continues and accelerates, approaching the pole shift, will virtually disappear. The Solomon Islands do not fare much better, for the same reasons. Tonga and New Caledonia ride high. The little Fiji Plate, as the recent sinking indicates, will be a loser, pushed down into the notch as the Pacific Plate presses ever westward. The North Pacific Plate is subducting under Japan and the Philippine Plate, and as the East Pacific Plate is riding over it to the east, this plate is overall being pushed down. But the push down is not even, as the portion being pushed under Japan and the Philippine Plate tips this North Pacific Plate, allowing the eastern part of this plate to tip up. 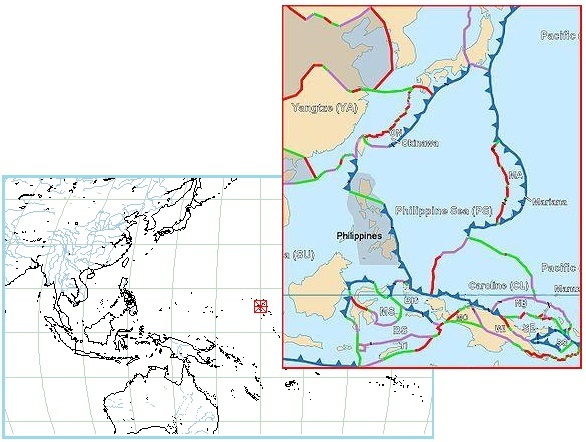 ZetaTalk Explanation 6/12/2010: There is likewise a portion of the Pacific Plate pushing under Japan and forcing the Philippine Plate to dive under Indonesia. This is tipping this part of the Pacific Plate so that the Marshall Islands and parts to the southwest of those islands are rising. These islands will benefit from the pole shift, though will not gain the altitude that West Samoa will. This tipping causes the Marshall Islands and to the southwest of the Marshall Islands to rise during the hour of the Pole Shift, but during the 7 of 10 plate movements, whereby the Philippine and Mariana Plates are being tilted and folded, there is resistance. Thus in steps and stages, the North Pacific Plate may temporarily be simply pushed down, without the tilt that will ultimately benefit the Marshall Islands. The reluctance of the Philippine and Mariana Plates to fold against one another, during the delayed 7 of 10 plate movements, combined with the delayed subduction of the North Pacific Plate under Japan, has temporarily held back the bounce the Marshall Islands would otherwise experience. They are struggling with flooding. Of course this is not “rising seas” else the rest of the world would be experiencing such a rise too! Water seeks its level, and does not rise in only one location. 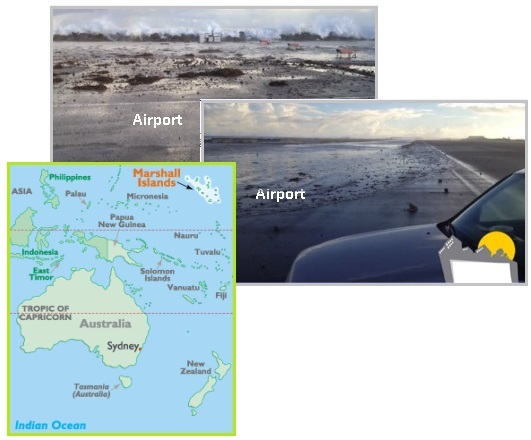 The tiny Pacific Marshall Islands are being inundated by record tides. Seawater has strewn debris across the islands and could further increase the salinity of freshwater resources that are already in short supply. Many low lying islands are suffering heightened coastal erosion and are losing freshwater resources to encroaching seawater. The idyllic beaches on the island of Buoj where Marshall Islands President Christopher Loeak fished as a boy are already submerged, and the ever-encroaching ocean now threatens to wash away roads, schools and airstrips. Flooding is most often attributed to rain, but per the Zetas there are multiple reasons for records being broken during the steadily progressing 7 of 10 plate movements. When the slope or depth of river bottoms is affected, water may be blocked, backed up, or flow more slowly. 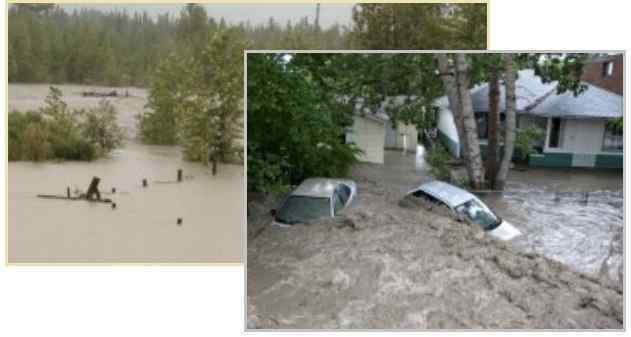 Floodwaters have caused massive disruptions in Calgary, as well as several other southern Alberta communities, including Canmore and High River. At least 100,000 Albertans, including about 75,000 Calgarians, have been forced out of their homes and large areas of Calgary's downtown core were being evacuated. 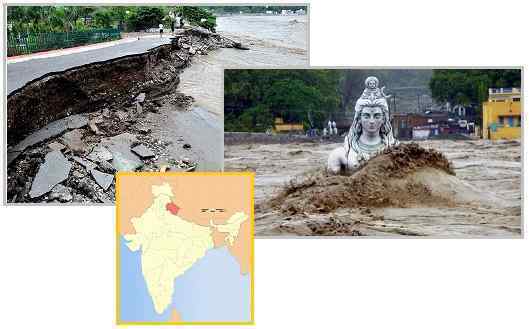 Indian officials described the devastation of the Uttarakhand as "unprecedented in 1,000 years" and said it would need at least five years for the flood-affected areas to recover. ZetaTalk Analysis 6/29/2013: What is lost in the reports on horrific and record breaking flooding is the role that heaving or shifting ground plays in the inability of water to drain in its accustomed manner. The N American continent is in a bow, the tip of Mexico pulled west while the top part of the continent stays in place. The Aleutian Islands and the tip of Mexico are the ends of the bow. 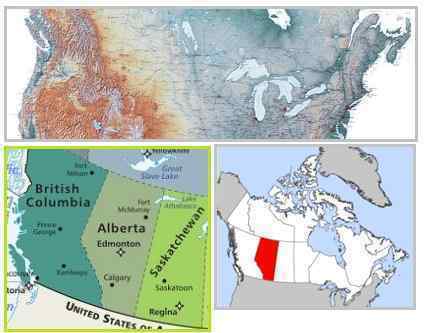 What happens when the land to the east of the Continental Divide is stretched in this manner? Grab the edges of a rumpled blanket and pull it taut and watch the blanket almost rise from the bed. Rivers drain along the lowlands, and when these rise as the land is being stretched, the rivers cannot drain as before. 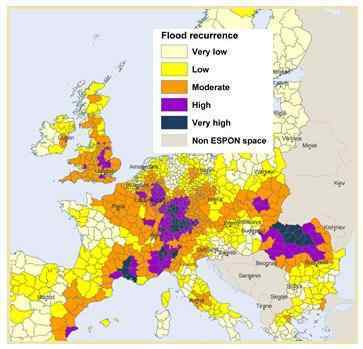 Examine this aspect of horrific flooding in various parts of the globe. Uttarakhand in India is where the flat land of India dives under the Himalayas. The land is being pushed down, changing the landscape for water that must drain away from this point. Water may drain as it did before, but more slowly, may accumulate at certain points before being released and then break through an earthen dam to be released in a rush. The Eurasian Plate is being stretched, sinkholes and twisting rails a plague from the UK past the Black Sea region and onto the far East. Thus stretched, river bottom lands in many places will interfere with drainage, causing flooding.